Most of the TATA DOCOMO users who recharged with special benefit packs should be aware of what is this article all about. Based on our observations there are may users who are afraid to recharge with special benefit packs from TATA DOCOMO as their base tariff may change from 1p/sec to 1.2p/sec or 1.5p/sec or something. Some say it doesn’t change while some say it does. 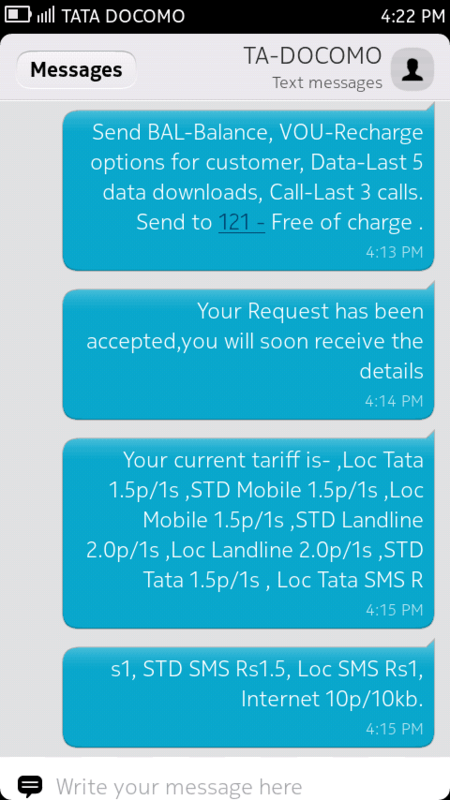 Though this happened to me some time back and I stopped recharging with any of the special STVs of TATA DoCoMo due to lack of clarity I would like to share my experience with our disruptive innovator TATA DOCOMO. Don’t know if users are still experiencing such kind of issues across circles PAN INDIA I would like to throw some light on what really happened with my case. I have taken a TATA DOCOMO number the very first day of its launch and my Base tariff is 1p/sec for all Local/STD, you can hear the total tariff details in the IVR recording below. Even today if I call 121 and hear MyAccount details, IVR announces the same tariff which I’m not enjoying but likely should be. Some time back TATA DOCOMO provided an awesome Combo benefit Voucher which is really worth the benefits for the price and even I activated it on my number. What actually should be my Base Tariff after the expiry of validity of this Combo Voucher? Normally it should be 1p/sec or the same benefits which should be as it is after the expiry of the pack right? But my Base tariff got entirely changed to 1.5p/sec after expiration of the validity of combo pack. I have repeatedly complained a lot of times and the cc was not able to clarify me on the same and in fact informed/stressed me that my base tariff is 1.5p/sec only as TATA DOCOMO is providing everyone the same Tariff. Fed up after repeated calls mailed the same issue to listen[at]tatadocomo[dot]com and again after repeated attempts I got full explanation from their cc that my base tariff got changed as I made a recharge with Combo voucher 198 and it changes the Base tariff permanently after its expiration. 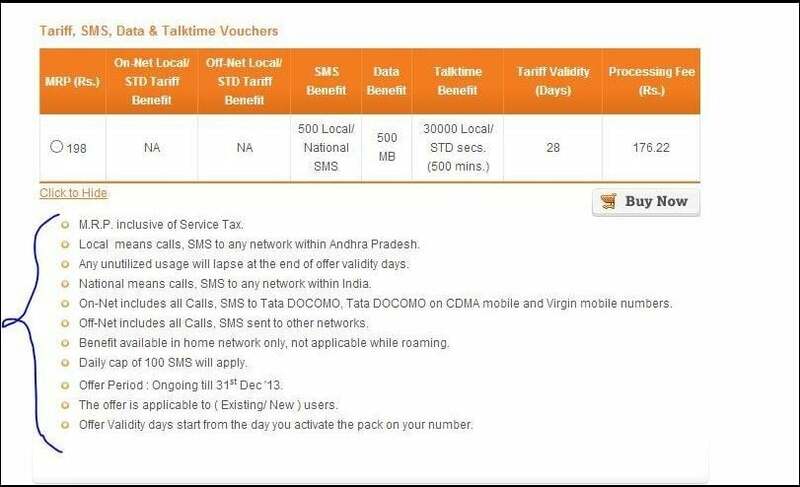 I was really shocked on how a special benefit voucher can do that and from that day I really lost interest in TATA DOCOMO and its misleading STV’s or packs. Everyone believes the brand TATA DOCOMO because it’s from TATA’s but I don’t understand why it acted so cheap by doing this way without even intimation or a small notification to users that activating this STV changes their base tariff. Does TATA DOCOMO wants it’s customers to indirectly change their base tariff by paying indirectly for it too just like the way prey is attracted for colors? Nowhere in terms and conditions also have they mentioned the same. I just wanted to let the users know how in a special soothing way Operators can turn down the benefits given to users. I’m not worried about the tariff here, all that matters in the end is trust, once it is lost can’t be recoiled back. Tata DOCOMO could have at least provided a small note on their recharge section or on their website regarding this condition where it failed or may be intentionally done. *198 This combo voucher is now no more available. If you argue that with the changing market scenario Base Tariff will be changing, yes I do agree that but I also have another number which I took on the same date and it’s still having a base tariff of 1p/sec because I never recharged with any combo or special benefit on that number. Dear TATA DOCOMO or any other Network users have you anytime faced such scenarios on your number? Do share your experiences with us via comments. Sir, what i have observed is that when i took a pack that says “….” and has valid as per sim after it, then the call rate that i get is of 1p/sec but when i used to recharge with 150rs and lifetime (with no “valid as per sim” thing written after it), then i would get 165rs but call rate as 1re/min. Just observed. Please check and confirm. Infographic: Beyond Basic Telco Services, What Indian Telcos Are Offering to Consumers?